Sesame noodles is one of my go to dishes for picnics because it's flavorful and holds up well while being light yet satisfying. It's also super simple to make with ingredients I pretty much always have in my pantry. This is fantastic as a side dish or a main. I like to serve it for dinner sometimes along with my Taiwanese cucumber salad as a quick and easy vegetarian meal. 1. Cook noodles until just tender, rinse well under cold water and drain. 2. Add 2 tbsp. water to the tahini and thin it into a slightly watery paste. 3. Add the soy sauce, rice vinegar, sesame oil, mirin, lime juice, honey and chili oil to the tahini and mix well. 4. Pour the sauce over the noodles, cucumber and carrot and toss thoroughly to coat. 5. This can be served immediately at room temperature or refrigerated for an hour or two if you prefer it chilled. It will keep up to a few days in the refrigerator. You can refresh it with a few drops of sesame oil and mirin the next day as it does tend to dry out once chilled. Oo sounds simple & quick enough to prepare beforehand for lunch on a school day. Where do buy tahini? I can already imagine how amazing/fantastic this would taste, but I'm surprised this isn't topped with toasted sesame seeds! Omg kove Sesame Noodles thanks for s haring looking forward in trying it out. Sfe it in my chef tap apo. By the way I nominated you for the Versatile Award come and read. I love noodles! It looks yummy! I love sesame oil and noodles! This one sure looks yummy and simple to throw together. This recipe sounds great and I will definitely try this out. Once I read the recipe it sounds and taste so refreshing. Thanks for sharing this. looks delicious. i love everything noodles! sounds like the perfect weekend lunch! Oh this looks yummy so glad for fall and getting cook more and make soup! I will have to try this too. Oh let me know if you want to hit some shows together in the spring I hope to have my ducks lined up by then. And hell I hope your ankle improves. it looks delicious rowena! i must give this a try. light, easy and good for you! that's exactly what I'm looking for. hahaha thanks for sharing. looks delish! wanna try this one. Oh yummy!! I love sesame noodles, but I've actually never made any myself! Thank you for sharing the recipe! 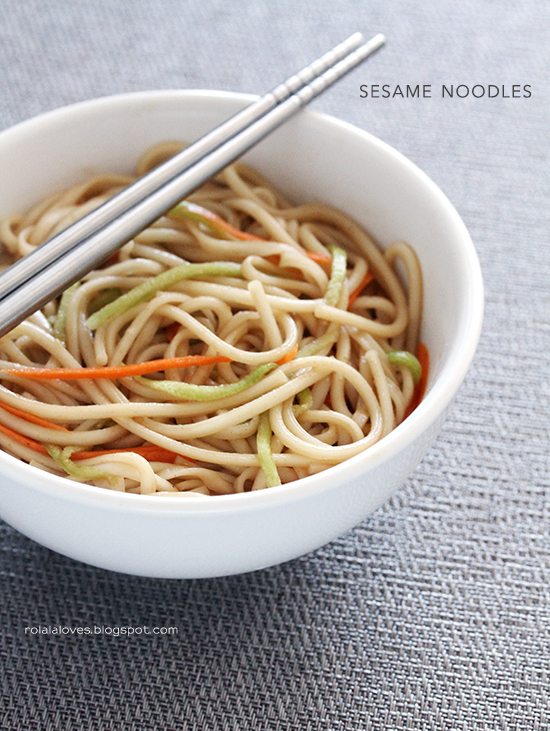 I love sesame noodles, now I know how to make them! Thanks for sharing this recipe! Yum, the noodles sound so good and I can actually have all the ingredients! I thought I remembered you not liking someone in Big. I have to admit I googled T.O.P. and it seemed like there were a bunch of different people so I never actually looked hard enough to see who he was. There could have been some photoshopping happening...IiP is actually the 3rd drama I have stopped watching, but I leave them in my queue just in case I want to try again. I don't think I saw Sherlock. I caught part of an episode recently about some people in a cafe that was almost in the middle of nowhere England. I have no idea of the title but it was funny. Boo to your wheat allergy :( I've actually made these before with rice noodles and it's a little different but still tasty. You just have to reverse the ratio of the sesame oil and tahini to get it to taste right in that case. I love noodles! This looks so delicious and i want to try it. Oh hmm that looks really delicious! And easy to do, nice. Yumminess, I am the hugest fan of anything with noodles so I have to try this out, thanks for sharing your delicious recipe. I doubt I will find tahini paste where I live, do you think it is possible to make it myself? oh my, this sounds easy enough even for someone like me not to mention delicious! These sound absolutely delicious - thank you for sharing the recipe Rowena! I love sesame. Thank you so much for your sweet comment, dear Rowena! Im a 0 in the kitchen but this one is easy. Gotta try it. YUM! I've been dieting because fashion week inspires me to try to lose some weight so this post has my mouth watering! I have been looking for a new soba noodle recipe! Thanks for sharing! I've never tried to make tahini before but I would think you could make it yourself since it just consists of sesame seeds and oil. My husband is obsessed with sesame noodles and I'm surprised I haven't made it before. Thanks for the recipe dear! Do let me know how you like it if you do Sara! It does! I hope you'll like it if you do try it out.